It occurred to me last night, as I interacted with the feedback from this piece on worrying about a baseball team, that for all my philosophical jive, my overnight teeth grinding has worsened to the point where I’ve cracked two teeth and have to wear a hateful mouthguard to save what’s left. This acceleration started taking place after Opening Day. The Reds owe me $1,042 for a crown and one hundred billion dollars for undue pain and suffering. Last night’s free pizza and discounted car wash ain’t gonna cut it. I wrote that even a bad moment, not even yet a loss, can feel like a physical blow. Well, last night I spent the last four innings standing up, running between my laptop and the TV and the radio, shouting things, twirling around the living room, slapping the back of the couch, not drinking enough water, and, during the back-to-back-to-back wonderstunt, feeling my heart rate put on the afterburners– as it tends to do while one is watching history, and one’s team has in sight a winning percentage of .200. This is the other side of the mouthguard. The box score goes on for miles. It’s like a CVS receipt. The man behind the magic, Marlins pitcher Wei-Yin Chen, was grimly left on the mound for the whole bloody spectacle, until Amnesty International parachuted in a diplomatic intervention squad. He left the game in the 9th with an ERA of 45. Dare we discover if we can win a game like a normal team instead of having to resort to a hydrogen bomb of home runs every night? Which could get expensive? First pitch is 6:40 PM. If I’m starting pitcher Tyler Mahle, I’m walking around with a puke bucket today, because I’m gonna be nervous. Although he has an ERA of 0.00 after pitching beautifully against Pittsburgh for six innings, his sparkliness was completely wasted by the offense, which was at that point was still at the bottom of the well it somehow wandered into. So now he’s got one wasted start and a teamful of Marlins who are very, very mad, plus a Reds offense that, seeing that they now have run differential of +1, might think that’s enough for April. It’s Trevor Richards, who sounds like every preppy bad guy in every 80’s movie ever. If Trevor’s company of land developers are trying to shut down a lodge and the Reds are the only thing standing between him and unemployment for the entire teen staff, things could get interesting. I expect a dance-off. I was on a business chat with someone in California while the game was going on last night, and the instant we started the back-to-back-back homers started reeling. The person on the other end wondered where I’d disappeared to. I considered the safe route and telling her that cow fell on my face or something, but the godmother in me forced out the truth. “The Reds just got three home runs in row,” I informed her. “I must be lucky!” she typed back. So then I informed her that I was terribly sorry, but she was going to have to remain on the line for approximately the next four innings. But let’s back this up: Who can we, really, thank for beating the Marlins by two touchdowns? When did the offensive explosion begin? Who is the conquerer amongst conquerers? 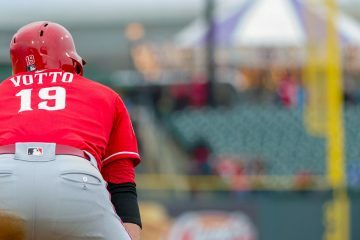 Where all things current Reds begin and end, of course: Joey Votto. Votto, if you’ll recall, was plunked by Chen in the 6th. Votto clenched his bat and took four decisive, stomping steps towards the pitcher, and… gently tossed the bruise-making ball right back to him in a gentlemanly, decidedly Canadian fashion. Now although the team had already scored two on Chen at this point, I do believe this was the moment in which he fully and completely lost his ability to function, not only as a professional pitcher of baseballs, but as a human being. For a space of two seconds, Joey Votto was advancing directly upon him with a baseball bat, with a dugout of Reds behind him, Reds who were still picking warning track dust out of their hair from the last fight. But then… JK! I’m just savin’ you some steps into the infield, bro! He was destroyed. He may never be the same. Wei-Yin Chen met the Lord last night. -Manager David Bell missed the game due to his stupid dumb one-game suspension, but he will be back tonight. Puig is out for yet another game because he has a stupid dumb suspension too, for being awesome. -Hunter Greene underwent his Tommy John surgery yesterday. -Eugenio Suarez’s home run last night was his 100th. -I will be in three different airports today and cannot eat any Cinnabon. Reds loaded the bases with 1 out, but couldn’t push one across. Votto pegged at the plate. Worth the chance trying to tag up. One out, bases loaded. Reds couldn’t push one thru, nothing new. Seriously, best game thread write-up ever! I strive to deliver as little useful information in as many words as possible. I’m worried about your teeth. Me too. You got a thousand dollars I can have? It’s only April. I need the thousand and plenty more for mine, I’m sorry to say. MBE…you need to get your California friend on the line…pronto! But then I’d have to talk to a person who voluntarily chooses to live in California, on purpose. Whatever happened to taking one for the team! The borderline for that ends in Nevada. If Thom says “Cat” when talking about a human one more time….. I know a lot of people don’t like these extreme shifts. I personally love them. I think it adds another strategy layer. Also, these look like different pitchers in the last 2 innings. In a transitional season like spring, it’s especially important to dress in strategy layers. ok… so i didnt miss much. Jessie sure ain’t Billy on the basepaths. That was ugly. Just got home and looked at the score … puke bucket indeed!!! Bell is the new Captain Hook. 2 wall scrapers….we’ll take it! This airport lounge is showing the freaking Yankees. 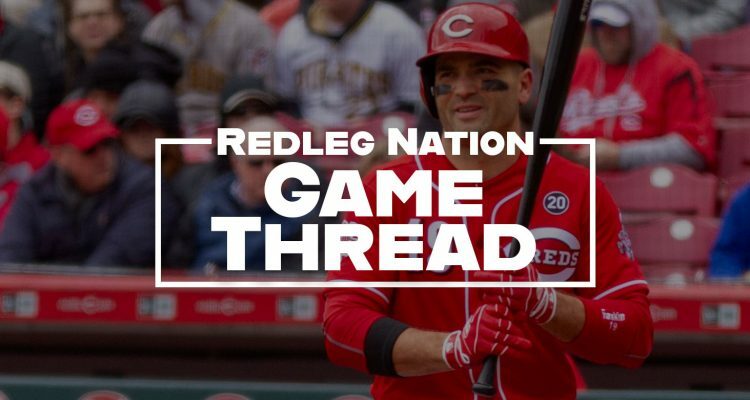 Free pizza, two GABP specials, and a clean inning by RI…. That decides it MBE. You are on game thread duty for the rest of the year. Clear your schedule, and put a recurring meeting on you CA co-workers outlook. Lets get this done!! Amazing to think that our starting pitching has been extremely good, for the most part. We’ve given up the 3rd least runs in MLB. You’d think that would have translated into at least two more wins. Let’s hope we can keep it up AND find a more consistent offense. Even tonight Mahle looked good (but I did miss the first three innings). The 4/5 he was doing well. One solo shot over 5. that’ll do tyler, that’ll do. The first few innings were fine. He gave up 4 walks but all 4 walks were full counts where ball 4 was close to the strike zone. Ground balls then stranded those runners. The only ball that was hit remotely hard was the home run. Just looking at the box score and seeing 4 walks may look like he didn’t have great control but most of those pitches were good. I should add the weirdness that the NL Central is the only division (outside of the Tigers) where the top teams have a negative run differential and the bottom teams are in the positive. Strange. 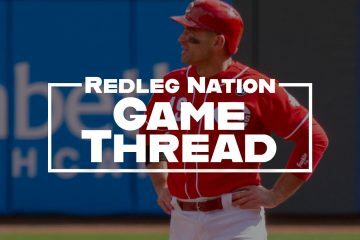 And this one belongs to the Reds and our Queen of the Game Thread Mary Beth Ellis!!! That’s Mary, Queen of the Game Thread. Happy almost Easter! So close! Come on Graeter’s cheese pocket!